It’s undeniable that the shipping law results in higher costs to consumers, and the reasons for preserving it are suspect. The world of Adam Smith did not share the technologies we have today. Yet he lived in a time when the world was expanding and new things were being discovered regularly. It can be argued that his vision of how economies worked then have changed little since his time. It is thought that those nations whose economies are primarily service-oriented rather than industrial are considered more advanced. However, there is also the argument that a viable economy must have a strong manufacturing sector. Many in industry and in academia see a potential threat to an economy dominated solely by the service sector. A reliance on outside manufacturing sources could threaten the strength of that economy through price controls and by those entities supplying the goods. What technology today has done to both of these sectors has opened up venues unheard of even two or three decades ago. While putting products in boats to sail across the oceans hasn’t changed in its concept since human commerce first began, the way in which it is done has been improved and made larger by many orders of magnitude as a result of technological changes. The equation still remains. Something must be sold and that ultimately requires the manufacturing sector. The cycle survives. We here in Hawaii experience an economy dependent on tourism and federal funds. There is little we have to trade. According to WalletHub, Hawaii ranks last in terms of exports in all 50 states. In the same report as quoted in the June 4, 2018, issue of the Honolulu Star-Advertiser, Hawaii ranks as the ninth-worst economy in the United States. Containers for Pasha and Matson in Honolulu Harbor. For years, many have cited the Jones Act as playing a significant role in the health of our economy. However, even the Hawaii caucus to the federal government has supported the continuance of the act in spite of evidence that it is poisonous. The question would be what is encouraging this stance. The Merchant Marine Act of 1920, otherwise referred to as the Jones Act, was put in place essentially to protect the American Merchant Marine. This was to be accomplished by mandating all commerce between U.S. ports be carried out by U.S.-flagged hulls constructed in the United States by American companies, crewed by U.S. citizens and owned by U.S. companies. This in response to the crisis in World War I when foreign flagged vessels were withdrawn from trade due to the German submarine offensive. This severely affected American commerce and its ability to transport its military equipment and personnel once the United States became involved in the war. 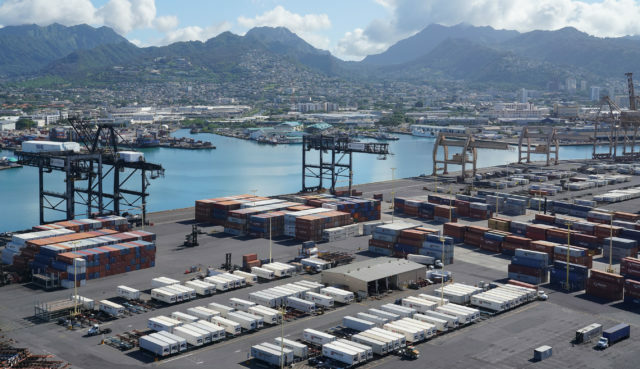 In essence, the act requires all goods being shipped to Hawaii from foreign sources must first travel to mainland ports for transfer to American hulls to be shipped to Hawaii. A ship coming from Shanghai with goods for Hawaii and California cannot stop and offload material destined for Hawaii and then go to a port in California. It must go to California, offload its Hawaii cargo to be transferred to either a Pasha Hawaii or Matson ship for delivery to Hawaii thus incurring a cost for unloading, reloading and shipment to Hawaii. What it has done is create a high cost of living for all of us. How that translates into a benefit is questionable. The preamble of the Jones Act envisions a merchant marine of sufficient size as to be able to meet the commercial needs of the country and whatever needs the armed forces may have to meet war or other national emergencies. It is protectionist in scope and in light of history one question remains, did it do its job? Hirono cites a General Accounting Office report and the chair of the Joints Chiefs of Staff as supporting the continuation of the act. In light of more substantive, compelling and contradictory data, it would appear that some information may have been extracted out of context. The Jones Act has in fact hurt the U.S. shipbuilding industry by insisting that the American-only workers be paid American wages which make American built hulls noncompetitive even with European shipyards. In 2001, a Department of Commerce study reported that only 1 percent or the world’s largest ships are built in the United States. In essence, the U.S. has priced itself out of the market. The idea of the current legislation being supportive of American shipbuilding is a myth. Today there are but a handful of shipyards capable of producing Panamax or larger ships. Very few commercial ships have been produced in the United States for many years. Most ships built have been for the U.S. Navy or Coast Guard. If the objective of the legislation was to support American shipbuilding, the American Merchant Marine, be a backup to military transportation and protect so-called American interests, it failed on all counts. The top 20 global shipping companies account for 87.6 percent of world seaborne commerce. Matson is No. 34 on a list of the 50 shipping companies that account for all shipping and is the first and only American company in the table of 50. It cannot be denied that the Jones Act results in higher costs for the people of Hawaii. For that reason alone, the act should at minimum be revised to allow foreign ships to stop here to offload their Hawaii cargoes. We are still being treated as a territory and not a full-fledged state. If an economic downturn affects consumer discretionary spending, tourism would be hit hardest. Should there be a decline in tourism, it could impact other elements of the service base. Car rentals would go down, hotel revenues would decline. There could be a domino effect on other sectors as well. Tax revenues would be hurt, thus limiting what infrastructure needs to be expanded or maintained. It has never been adequately explained as to how higher consumer costs benefit Hawaiians. Where is the tradeoff? The Jones Act has been identified as the single most significant item that is responsible for the high cost of living in the state of Hawaii. Common sense and logic alone proves this. However, when Hirono gave her speech in the Senate in support of retaining the Jones Act, she may have been misinformed with the information she was provided. It could also be argued that the Jones Act is a huge impediment to business growth in the state of Hawaii. It has prevented business from looking at Hawaii as a place where innovation can thrive as bringing personnel and materiel into Hawaii is expensive. The incentive of living in Hawaii should be enough to enlist talented people in cutting edge industries to flock to our paradise. But when a high cost of living and constraining shipping laws are in place, paradise looks a little like a third world country. Hawaii has become stagnant. It must become competitive in world markets. 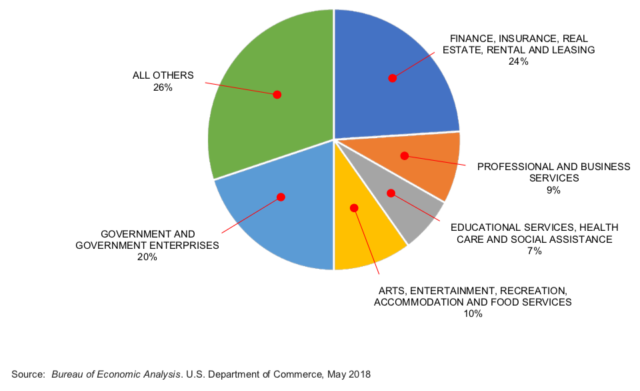 Hawaii Business Sector As A Percentage GDP, 2017. Higher consumer costs translate into higher cost of living. How can Hawaii attract new business when costs to produce and higher overheads make Hawaii noncompetitive, especially in an economy dominated by businesses in the service industry sector? The largest impediment to any economic growth in Hawaii is the Jones Act. Repeal it and we can discuss how we can bring industry to Hawaii that will improve our cost of living and our lifestyle. Hawaii can still be the land of Aloha. However, it must become a part of a larger world economic picture; otherwise it will die a very quiet death economically and socially. Defending our Native Hawaiian culture has been a struggle. Perhaps having a better economic climate will facilitate a stronger Hawaiian future. Additionally, it would be hoped that the current supporters of the Jones Act see its repeal not as having a negative effect on their own pursuits but as an opportunity to participate in an expanding Hawaiian economy. For Hawaii to continue on in its current state spells not just a declining economy but certain atrophy. How does that increase shareholder value? If there are any doubts to the validity of the argument of rescinding the Jones Act, it is recommended that a panel be convened to present and review irrefutable facts. The current state of affairs is counterproductive. It must change. Victor Craft is a retired aerospace worker having functioned as an FAA certificated Airframe and Powerplants Technician, Logistician and Quality Assurance director working on several major weapons systems. Vic also served tours of duty with the armed forces in Vietnam, Kenya and the United Kingdom.